The Alexander Wang Diego Bucket Bag is a classic style which exudes a kind of laid back chic. 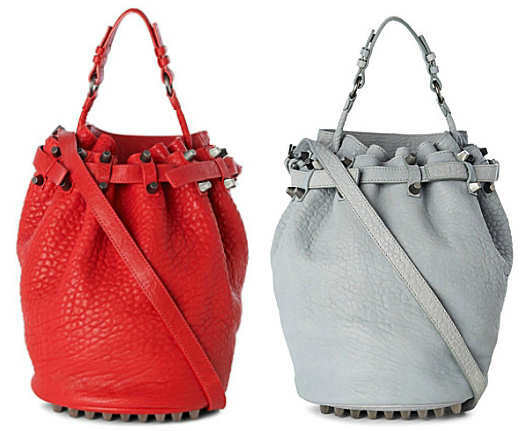 Made from pebbled leather, the bag has a chunky studded base and there is also stud detail around the top of the bag. It has a top handle and an adjustable shoulder strap. The opening of the bag is gathered and inside there are two compartments, a single zip pocket inside and an external patch pocket on the reverse of the bag. The bag is delivered with a protective dust bag. Style note: You can wear this bag over the shoulder, in the hand or cross body. It is a funky and original looking bag, and something of an iconic Alexander Wang style. It’s a cool look that works well for both day and evening wear and a real conversation starter.